This entry was posted on January 5, 2014 at 11:18 am and is filed under Cats, Video, Winter. You can follow any responses to this entry through the RSS 2.0 feed. You can leave a response, or trackback from your own site. MagnifiCat! This time I tuned in for a good 20 min. plus of Turk’ sleeping, watching, washing, stretching followed by views of the winter scene and mountain view . Usually I miss the live cam. Patrick, please explain to this dumb Easterner why Bibleburg doesn’t receive much snow. Must have to do with the topography? He’s a handsome devil, isn’t he, Libby? Has an evil streak a mile wide, though. He ambushed my left ankle with teeth and all four paws last night. Happily, I was wearing heavy socks and sweatpants or today I’d need a peg leg, a parrot and a poopdeck. As to local snowfall, I’m not quite certain what the deal is there. The easy answer is climate change — four of our top-10 lowest-snowfall seasons have occurred since 2001. Cold we get; snow, not so much. I was aware there has been long-standing drought but thought maybe there was some sort of special biosphere in Bibleberg due to its particular location…. Patrick, I realize I just fed you a straight line but really, skiers are always saying how wonderful it is to ski out West; the snow, the sun, it’s not dreary and overcast like the Northeast. Could be, Libby. I’ve lived here off and on since 1967 — call it 25 years all told — and don’t recall any truly crippling winters. Shoot, I didn’t even have a driver’s license until the end of my first year of college, in Alamosa (talk about your evil winters). Rode a bike, walked, or bummed a ride. And yep, even a nasty, cold, snowy day here can include blazing sunshine. It’s pretty easy to get sunburnt all to be damn, even in winter, as many an East Coaster has learned the hard way. I’m far from an expert, but the little bit of reading I’ve done points as much to decade-or-longer coupled atmosphere-ocean oscillations such as ENSO (El Nino/Southern Oscillation) as well as current climate change as far as climate is concerned in the Southwest. Recall the SW has long been subject to decadal and longer drought cycles, as the Native Americans found out when they had to abandon civilizations such as Mesa Verde and Chaco. The purple jet stream track in Fig. 2 of this reference says it all: cold as hell and dry as dust. John Fleck has been covering this really well in the Albuquerque Journal, if any readers here have a subscription. More cycles. This U of A site is very good. OK, I am checking out these links. Thanks! Regal awesome photo…Thanks! Reminds me of our white cat in SouthDakota who was named Gringo. 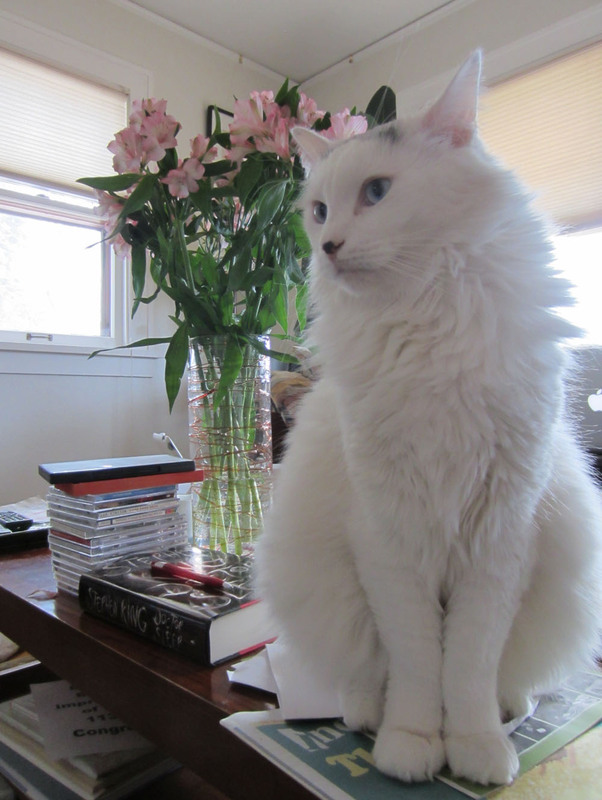 He loved to sit on his haunches and box with the peonies and daisies in vase on oak dining room table. The Turk’ loves flowers. He’ll hop up on the table and give ’em the old rub-a-dub-dub. Actually, he’s pretty much all over anything with a strong scent. Flowers, bleach, incense, it’s all good to the big fella. The cat reminds me of one in the TeeVee spots for some sort of “gourmet” cat food. They call the stuff “Tuscan” as if the cat’s been to Tuscany and just adored the food there….or maybe heard about it from his cat friends who live in Tuscany? Check with the Turk and get back to us on this. Larry, the Turk has unquestionably been in touch with the woman in Castellina who strolls her cat up and down the main square in a baby carriage, the cat sitting regally looking at all he passes with the “wtf you lookin’ at?” vibe going on. Yeah, there must be an international cat organization sharing these details – will we soon see POG pushing the ‘Turk around in a stroller like his Tuscan compatriot? Currently in SLC airport. Seems all the jet fuel in Chicago is frozen so no point in getting stuck there. Instead we got AA to put us on a Delta flight LAX-SLC-OMA where we’ve rented a one-way car for the final 100 miles north to SUX…might even end up back home sooner than the original schedule! A good, informative and enjoyable read on the climate as it relates to the SW US is “A Great Aridness” by William deBuys. Heard him speak at Northern Arizona U about 18 months ago……he’s lived in NM for years and blends history with scientific data and strong writing skills.